There are many reasons to give thanks for the long life and good work of Dr. Gerrit W. H. Schepers who died on September 6, 2011, at the age of 97. As a South African specialist in occupational disease he had witnessed first-hand the appalling and degrading conditions at the amosite (brown) asbestos mines in the North Eastern Transvaal. The findings of an official medical survey of the Penge Amosite Mill which Dr. Schepers conducted in 1949 confirmed that cases of asbestosis were common amongst the mine workers and had been found in employees as young as twelve years old. This was not surprising as it was the job of children to trample down fluffy raw asbestos fiber in large shipping bags. They would do so by jumping up and down on the fiber inside the bags. In the face of the Schepers report, the authorities did nothing. Gerrit Schepers was born in 1914 in Philippolis in, what was then, the Orange Free State and is now the Free State Province. Although his mother tongue was Afrikaans, he was fluent in English and German and well-versed in Latin. The Bachelor of Medicine and Surgery degrees he obtained in 1938 at Witwatersrand University in Johannesburg, were followed by a Doctor of Science degree in 1945 and a Doctor of Medicine degree in 1948. Dr. Schepers' interests were wide ranging and varied. His interest in human paleontology brought him into contact with Robert Broom, an eminent South African expert, who he worked with on excavations of australopithecine remains at Sterkfontein and elsewhere. A leaky heart valve disqualified him from military service during the Second World War. In 1944, he was sent to work on the Miners Phthisis Medical Board in Johannesburg where he stayed until 1954. A fellowship from the Harkness Foundation allowed Dr. Schepers to pursue his studies in the U.S.1 In 1949 he visited asbestos production, processing and research facilities in North America. His research was facilitated by Dr. Anthony Lanza, the leading U.S. authority on silicosis and asbestos disease and a consultant to major asbestos firms, who enabled Schepers to visit Quebec asbestos mines and factories as well as the Saranac laboratory in New York where experimental work was being done for asbestos companies. A copy of the report Schepers wrote of his observations was requested by Lanza who passed it to Vandiver Brown, the chief lawyer for the Johns-Manville Corporation, one of the world's biggest asbestos conglomerates. The lawyer demanded the report be suppressed. Schepers refused and duly submitted his findings to the authorities upon his return to South Africa in September, 1950. Brown travelled to South Africa; the report was buried. 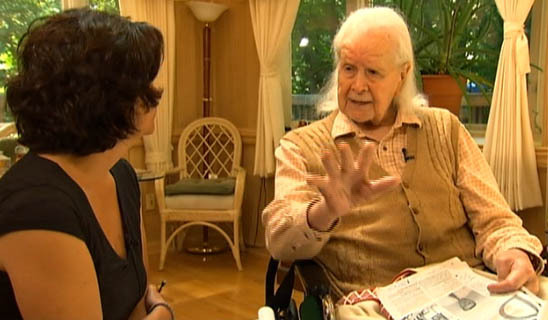 Dr. Gerrit Schepers being interviewed by Josee Dupuis July, 2011. Dr. Schepers' work will be carried on by all the students and colleagues for whom he was a source of inspiration and knowledge. His spirit will live on in the hearts and minds of those who campaign to make the world a better place. He did not bow down in the face of powerful forces or succumb to commercial pressures; neither will we. 1 McCulloch, J. (2009) Hiding a Pandemic: Dr G.W.H. Schepers and the Politics of Silicosis in South Africa. Journal of Southern African Studies, 35: 4, 835-848. 2 Malinder L. Deadly Secret. Canada's History, April-May 2011.